A mum’s texts looking for breast milk from another mother has gone viral, after the exchange turned nasty very quickly. Images of the conversation were posted to Imgur, showing the mums text asking for breast milk for her two-year-old son. The mum said she’d heard from a friend that the other lady had donated breast milk to a baby in need and was wondering if she had any to spare. The other mum was happy to help out, asking how old the baby is and how much was needed. “Oh that’s amazing. My boy is almost 2 and he eats lots lol. I’ll take it all off your hands haha,” the mum wrote back. 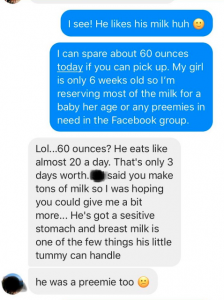 When the other mum wrote back saying she can only spare about 60 ounces because she has her own six-week-old baby girl and she usually only helps out infant/premature babies, the woman wasn’t happy. “Lol…60 ounces? He eats like almost 20 a day. That’s only three days worth,” the mum replied, saying her son had a sensitive stomach and can only handle breast milk.,” she said. That’s when the other mum responded, telling the woman that her child is in fact a toddler and not a baby who can only feed exclusively on breast milk. “I’ve offered you what I can spare already and am happy to see how much I have left over adter donating the majority this weekend,” she said. The other mum was having none of it and text back calling the good samaritan a b**** and telling her she could keep her ‘sour milk’. “Feel sorry for whichever poor kids ends up with it,” she said. Ummm OK then. That got nasty pretty quick. Oh my goodness, I’m in shock. Wow, that really did turn nasty very quickly. There is other alternatives to breast milk for the toddler I’m sure. I’m sorry but I agree that newborns and premmies deserve the breast milk first. Maybe that’s why the Mum who was asking for the breast milk left out the fact her child was actually a 2yo toddler. She should have been grateful to get anything at all. wow! I’m sorry but a 2yr old does not need it. She’s lucky the mum was happy to give her any! If the kid has a sensitive stomach I’m sure there’s other options like goats milk or almond milk. What a lovely gesture from the mum donating her milk for prem babies ???????? Gee whiz, that is pretty appalling behavior. OMG and Wow! Gobsmacked comes to mind. Simply, I’d be blocking this woman quick smart. We went to a donor bank to get breastmilk for my first who was a premmie. I wouldn’t personally approach people about this, keeps directly conflicts out of the way. The poor woman had offered her help and did not deserve this type of nasty response. I actually donate my excess milk to a mum with a 2 year old. 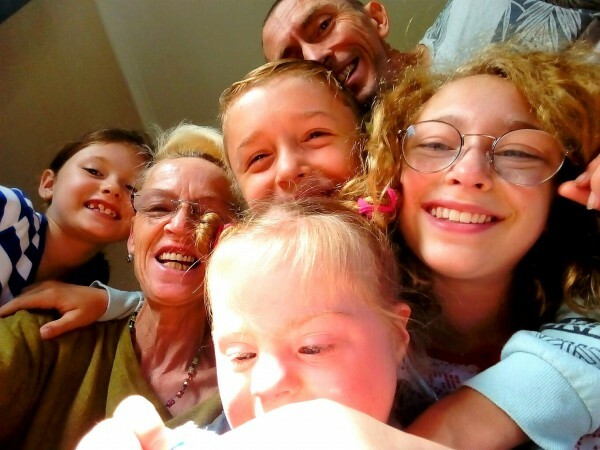 He was born prematurely and has afew health issues. She openly tells all who she asks milk from the reasons why and it’s ‘our’ choice if we donate or not and she as always been pleasant if we don’t have any or have given to others in i.e newborns. This mother of the 2 year old is just out right rude! No understanding what so ever of the 2yr olds mum, she sounds very selfish and spoilt. There is some very ungrateful people out there.